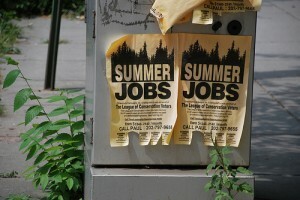 Are you making the most of your summer job? Perhaps you’re “just waitressing” or working at the mall or a grocery store. But, did you know that a temporary summer job can help boost your future career? In fact, did you know that New York City’s Mayor Michael Bloomberg was once a parking lot attendant? Or that Howie Mandel started out as an amusement park attendant? There are lots of great stories about first jobs of many famous and successful people in this MSN Money story – but my point is this: just because you’re not in your dream job now, doesn’t mean you can’t be working like you’re in your dream job. So, how can you make the most of your summer job? Whether you’re working at a fast food restaurant, in retail or even babysitting, this is your chance to build a foundation of experience! Look closely at your job responsibilities. What skills do you use every day at work that can be applied to your future career? Likely, you’re building organizational skills and you’re learning to be accountable for yourself, and you’re undoubtedly gaining customer service experience. All of these things are called transferable skills – a versatile set of skills that you can apply to more than one job. So, while you may not even be working in your major field this summer, you are gaining experience that can be applied to your future career. Take your job seriously this summer! Use your summer job as an opportunity to try new things, experiment with your abilities and gain new skills. To do this, you need to set some realistic goals and establish clear communication with your supervisor. Perhaps you can request to work on a special project or shadow another employee who has greater responsibilities than you; or you can ask for some responsibilities beyond your day-to-day tasks. Want to gain some financial acumen? Ask to shadow someone in the accounting department. Want to improve your organizational skills? Ask to lead a project or take on responsibilities in the stock room. If you think about all of the departments that make the business run where you’re working this summer, you’ll likely see opportunities in many areas. As you gain experience this summer, make a list of your accomplishments – and your failures. What were you good at? What didn’t go so well? What did you love to do? What did you decide that you never want to do again? Once you have a list that summarizes your summer work experience, you can use this information to help build your resume and a list of skills that you want to either acquire or improve on in the coming months. This process can help you choose classes for the fall – for example, if you learn that speaking in front of others is a weakness, you can take a public speaking class. Creating this list can also help you in selecting internships and finding future jobs that will help advance your skill set as you prepare for your future career. Perhaps more important than any other aspect of your summer job, you are provided an opportunity to develop relationships with others who could become a mentor to you. Having a mentor to guide you in your career development, to help you network with others and to provide honest feedback and suggestions about your work, your skills and your potential … is priceless. Some of the most successful people have sought a mentor at a various times in their career. In fact, many executives continue to seek mentors long into their well-established careers. Some even have more than one mentor at a time! Once established, though, these relationships will encourage you to stretch and reach for your potential, to truly build your legacy and your career. So, while you might think of your summer job as “just a summer job,” think again. As Steve Martin once said, “I just believe that the interesting time in a career is pre-success, what shaped things, how did you get to this point.” Now is your time to write your story, to build your success, before you have a career.